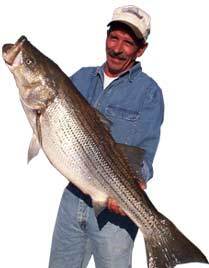 We are the number one Striper fishing guide service on Beaver Lake for Striped Bass "Stripers!". If you are looking for that trophy Striper, Beaver Fever Guides will put you on fish. Plan your next trip to Beaver Lake, one of the best Striper fishing lakes in the country for trophy Striped Bass. Beaver Fever Guides runs 4 boats (others available), so we will always have room for your group. 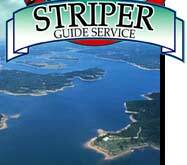 Our professional staff and guides will provide one of the best Striper fishing experiences possible! Take a look at our Photo Gallery, it is chalk full of limits and trophy Striped Bass photos from recent guided trips. 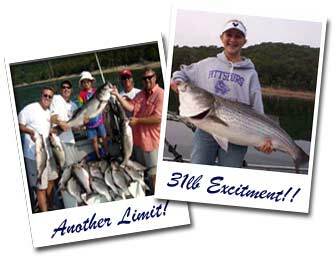 View our Customer Testimonials of past customers who have caught Stripers on Beaver Lake with us. Don't wait, get your Striper fishing trip scheduled and the camera ready! Because a guided trip with Beaver Fever will produce fish! $100.00 Deposit required in advance for all bookings. Deposit will be transferred in full if booking is rescheduled 14 days in advance. Click here to signup and receive notifications of last minute special striper fishing trips.